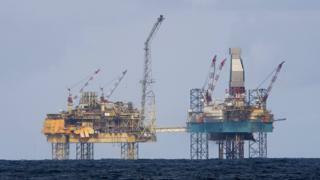 A total of £200bn needs to be spent by exploration and production companies to fully exploit the UK oil and gas sector's remaining potential, a new report has said. Industry body Oil and Gas UK (OGUK) said its Business Outlook Report 2019 showed the need for a focus on cost and efficiencies was the "new reality". The study reveals production has increased by 20% over the past five years. This follows 14 years of decline. The report found 62% of contractor companies had an improved outlook for 2019, but that many areas of the supply chain were still facing challenges. The £200bn figure is seen as pivotal for "adding a generation of productive life" to the area. OGUK chief executive Deirdre Michie said the report showed that industry's approach during the downturn was delivering results. She said: "Following 14 years of decline, production has increased by a fifth over the past five years. Cost improvements are being sustained and there is building momentum around exploration, with more new opportunities being drilled and the largest two conventional discoveries for a decade made in the second half of 2018. "Our report finds an industry that's getting better at what it does, getting smarter in how it does it and is well positioned to deliver attractive returns on investment within this environment, maintaining our global competitiveness. "This is the new reality and we need to embrace it." She acknowledged that supply chain companies faced challenges with revenues and profit margins still under pressure, and cash flow stretched. "If capabilities and resources are to stay anchored here in the UK, there must be a competitive proposition for supply chain companies to invest in too," she added. "With focus on adding a generation of productive life to the basin, our report reveals around £200 billion will need to be spent to find, develop and operate the reserves of the future. "This is a UK industry which is critical for security of energy supply, at the heart of the move to a lower carbon economy, supports hundreds of thousands of jobs and contributes billions to the economy. Scotland's Energy Minister Paul Wheelhouse said the report showed that the strategies adopted by operators and the supply chain were now helping to deliver sustained efficiencies across the sector. He added: "However, it is clear that more needs to be done to realise the industry's Vision 2035, including diversification into new areas such as transitional technologies and areas such as hydrogen production, and providing sustainable opportunities for the supply chain which, while seeing improvements, is still continuing to face challenges in some areas. North Sea oil and fish: Independence day?